Living Liturgy™ is your comprehensive go-to guide for preparing Sunday liturgy. This 2020 edition provides completely new content from an engaging team of expert authors, What you get is practical, sound, and inspiring preparation for your parish ministry. Living Liturgy™ integrates daily living, prayer, and study in one inviting and easy-to-use resource. It is an indispensable guide that deepens and strengthens the worship experience for the whole parish. It includes featured liturgical texts, supports for ministry, and utility features. 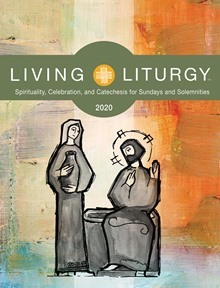 Consider it an essential resource for connecting the liturgy to leadership so that celebrating the liturgy and living a liturgical spirituality become the focus of each ministry. The three authors of this resource have provided fresh insights for each Sunday's liturgy, as well as holy days, Paschal Triduum, Thanksgiving Day, and other occasions. Taking just a little time to focus on their insights and suggestions, you can easily make the material your own, giving you a stronger sense of confidence as these liturgies unfold. Living Liturgy integrates daily living, prayer, and study in one easy-to-use resource.